If you’ve tried making sushi at home with a bamboo mat, seaweed and sticky rice, you know it’s tricky to turn out professional-looking rolls. 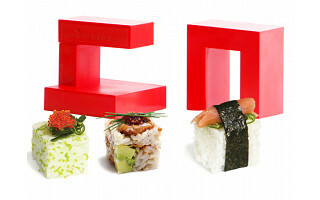 With the Rice Cube, you can make perfect sushi squares that will wow your family and friends. Australian patent attorney Ross Patten invented the gadget before his appearance on the cooking show MasterChef. The apparatus is simple yet turns out impressive cubes. It consists of two geometric pieces that, when fitted together, form a void in the center. With some sliding and pushing motions, you can squish rice, fish and other ingredients into the void to create presentation-worthy blocks of sushi. Sushi is just the beginning of the cubing possibilities, however. Risotto, polenta, potato, cheese, and falafel are all perfect for squishing. For a sweet treat, you can experiment with brownies, fudge, dates or apricots. The bite-sized portions are just right for cocktail parties and potluck dinners, and the novelty of the cube shape is ideal for enticing kids to eat some strategically-cubed veggies. For hors d'oeuvre, entrees and desserts, square is the way to go. 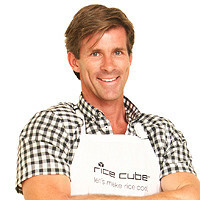 I am the inventor of the Rice Cube and we're excited to be launching it now in the US. I am currently many time zones away in Australia, so Anne and Kerry will be available to respond to questions and comments. We are also interested to hear how you like to make your food more fun. This thing is really fun to play with. @Lindsay Hi Lindsay, Glad you are having fun. Have you tried it with other foods? I had some mashed potato in the fridge that I used in the Rice Cube. I blended in some grated Parmesan cheese then sauteed in olive oil to heat and brown. Mmmmm. i want to buy this and cannot find a way or button to hit to "go to cart"? I'm Anne with Rice Cube and I'm here to answer questions and share ideas on how to have fun with food. Rice Cube is really awesome, so easy to use and fantastically fun! Glad that you like it! What types of sushi or foods have you made? @Celeste Great idea - I'm going to do that this weekend. Plus it is a gluten free dessert. oh! Must have now! Wonderful. :) Thank you for making this, for us clumsy sushi lovers and creative party gourmet chefs. @Lani You'll rock the party circuit with everything perfectly square. I recommend using Jasmine rice to get the perfect "cling" between grains. I think this is adorable & looks like fun. But, what makes the fruit mixes hold together? You don't just mash dried fruits in there in hopes that they will stick do you? (Me, I can roll my own sushi, it is not that hard, then you get a whole roll instead of taking alot of time to do each piece, BUT, you can make different variations w/this cube, which is what I like the most about it.) Plus, my mom cant' stand the taste of nori, so I might be able to get her to eat a veggie roll w/out the nori holding it together! @RHONDA Hi, I use banana's in y Rice Cube - they tend to hold their shape really well. My kids add apple to the center of the banana for extra crunch. You could also try adding the fruit to rice and make the cubes that way. Then add those to a plate that already has a sauce base - like chocolate sauce or custard. Yum! I don't like Nori and my kids are Gluten Free - this is the greatest concept ever! @Kerry I think it's a great idea. It would be even better if it came with an idea/recipe book. Not everyone is creative. You can get in touch with The Grommet's customer service and they will direct you to some great recipes! If you’ve tried making sushi at home with a bamboo mat, seaweed and sticky rice, you know it’s tricky to turn out professional-looking rolls. 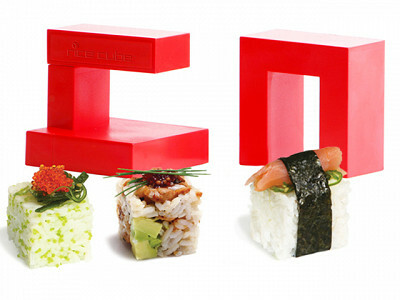 With the Rice Cube, you can make perfect sushi squares that will wow your family and friends. Australian patent attorney Ross Patten invented the gadget before his appearance on the cooking show MasterChef. The apparatus is simple yet turns out impressive cubes. It consists of two geometric pieces that, when fitted together, form a void in the center. With some sliding and pushing motions, you can squish rice, fish and other ingredients into the void to create presentation-worthy blocks of sushi. Sushi is just the beginning of the cubing possibilities, however. Risotto, polenta, potato, cheese, and falafel are all perfect for squishing. For a sweet treat, you can experiment with brownies, fudge, dates or apricots. The bite-sized portions are just right for cocktail parties and potluck dinners, and the novelty of the cube shape is ideal for enticing kids to eat some strategically-cubed veggies.